2014 Topps Fire Football was one of the most distinct pigskin products in recent memory. 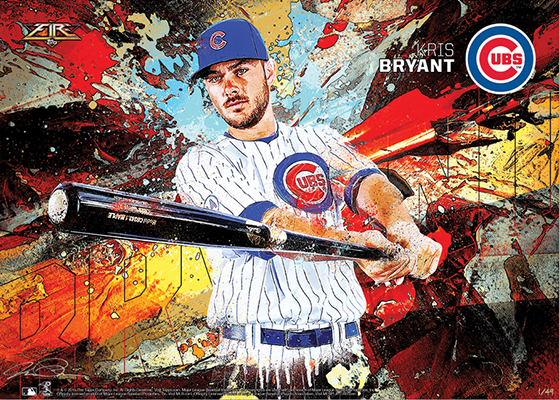 The look and feel has been brought over for 2015 Topps Fire Baseball. They're not cards, though. 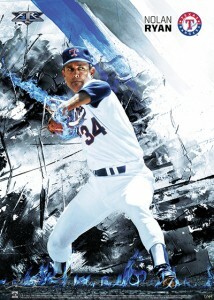 Rather, they're a line of limited edition prints sold exclusively on the Topps website. 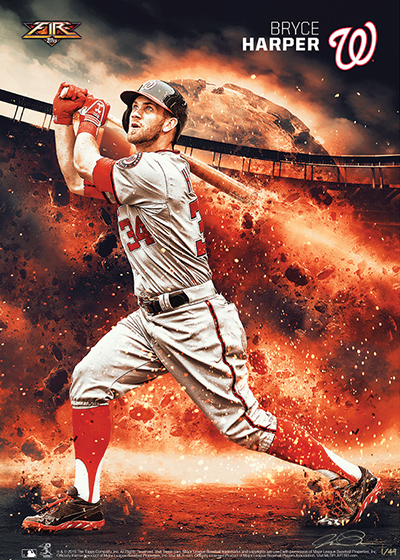 Created by digital artist Tyson Beck, each of the 2015 Topps Fire Baseball prints measure 10x14. Regular versions are limited to 49 copies. Each also has a Gold version that's a one-of-a-kind, and they're printed on cotton fine art paper. Prints are signed and hand-numbered by Beck. 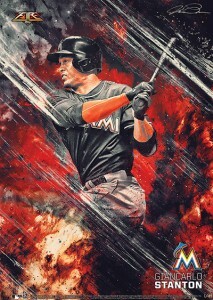 A total of 34 players are featured in the 2015 Topps Fire Baseball checklist between the original 20-card run and the 14-card update. Kris Bryant, Mike Trout, Nolan Ryan, Ichiro and Bryce Harper are among the highlights. In addition to the individual prints, Topps released complete sets for the original series done in a 5x7 format. Printed on glossy card stock, these are not signed by Beck. Basic sets are foil numbered to 99 while a Gold version is numbered to 49. Finally, Derek Jeter is included in the 35-card Metallic set printed on metal stock. These are limited to 49 copies with a Gold version that is numbered to 10. Beck's work stands out because it's so wild. These have the same overall feel as the football set with lots of explosions, flames and just general background destruction. 34 subjects. 10x14 numbered #/49. This checklist is missing Noah Syndergaard? James: There was an original set and later an update that included Syndergaard.